Chevron’s support of programs for women is helping transform ideas into economic success. Nilcinea Oliveira was watching television in the seaside town of Itaipava in northern Brazil when she saw a story about how to make soap with used home cooking oil. In this port community, most men make a living fishing, but the employment opportunities for women are limited, and the report sparked an idea that would change her life. “The story gave me the notion to make cleaning products by recycling the cooking oil to earn extra money for my children and my husband and to help the environment,” she said. Today, Oliveira’s company produces cleaning products and employs 19 women. The project received support through the Community Inclusion Project (Projeto de Inclusão Comunitária), a nonprofit organization that trains women in small business development. Chevron partners with local nonprofits like the Community Inclusion Project and nongovernmental organizations across Argentina, Brazil, Colombia and Venezuela – where our affiliates and subsidiaries have worked for more than 90 years – to provide microloans, education and job training to improve women’s livelihoods. Since 2011, more than 10,000 women throughout Latin America have received job training, skills development and small business microloans through Chevron-supported women’s empowerment programs. In the first decade of the 21st century, the World Bank reported, contributions from women in the workforce reduced extreme poverty in Latin America and the Caribbean by 30 percent. Nilcinea Oliveira started her business, which produces cleaning products, through the Community Inclusion Project. Our support of women’s empowerment programs aligns with local priorities established by our Latin American country partners. These programs help remove barriers to economic growth through social investments in health, education and economic development. “Chevron believes that supporting female entrepreneurship is one of the most effective ways of empowering women, positioning them as generators of wealth and as forgers of the future,” said Harry Lopez, business development manager for Banauge. In Venezuela, women’s empowerment programs are important because women head about 40 percent of households, the highest level in Latin America, according to the Venezuelan National Institute of Statistics. For more than ten years, Chevron has supported the development of Emprered, a nonprofit organization that has trained nearly 7,000 entrepreneurs in four Venezuelan states in project planning, marketing, finance and other skills necessary to develop successful businesses. Chevron also supports Dressed With Dreams (Vístete de Sueños). The Venezuelan-based nonprofit trains formerly abused women to create and design clothing and gives them the skills to start their own businesses, encouraging financial independence. The program has involved an estimated 1,050 people since 2012. “Every morning you have a new opportunity to start over, to take off the dress you wore yesterday, give it a new pattern, sew it up and put it on again. And now you’re a new you, you’re renewed,” said Alberto de Castro, founder of Dressed With Dreams. Fashion designer Alberto de Castro instructs a student at a workshop in the Dressed With Dreams (Vístete de Sueños) design studio. In Argentina, we partner with the Other Voices Foundation (Fundación Otras Voces), a nongovernmental organization, to support Entrepreneurs in Action (Emprendedoras en Acción). The program provides training in accounting, marketing, and business and personal development as well as other support. Program participants are women from poor neighborhoods in the city of Neuquén who want to establish cooking and sewing enterprises that enable them to support their families. From 2013 through 2014, our support helped nearly 200 women participate in Entrepreneurs in Action. Susana Fuentes prepares food for sale as a participant in Entrepreneurs in Action in Neuquén, Argentina. In Brazil, the income of women living in poverty accounts for about 40 percent of the total family income, according to Data Popular. Also, the Brazilian Institute of Geography and Statistics reported that households headed by single women, which account for 35 percent of all households in the country, are 70 percent more likely to suffer from poor living conditions. The Brazilian president has made economic empowerment of women a policy priority in recognition of women’s contributions to improving the nation’s economy. Chevron’s support of the Community Inclusion Project, which helped Oliveira build her business, has benefited approximately 440 participants from 2011 through 2014. 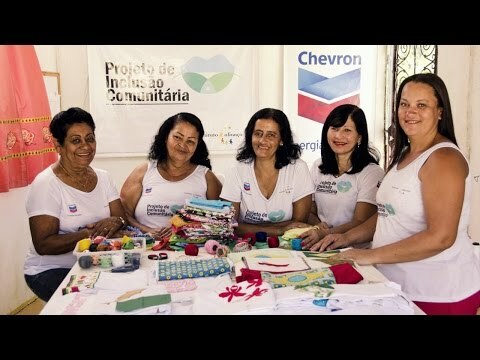 In addition to supporting the Community Inclusion Project, in 2014 Chevron launched its support of another Brazilian organization, the Rede Asta Network. The organization helps female artisans in low-income areas build small businesses through training, forming production networks and setting up sales channels to sell crafts. Chevron employee volunteers conduct workshops with the network to improve business management skills with a goal of increasing sales by 35 percent by the end of 2015. Of the 48 small businesses assisted by the network, our investment in 2014 helped support 11 small businesses involving 55 women. Along the northern coastal area of the Colombian state of La Guajira where we operate, fishing is a way of life to the indigenous Wayúu communities of the region. It is one of the country’s most impoverished states. For nearly 40 years, we have worked with the Wayúu, producing energy, strengthening the communities’ capabilities and respecting local customs. Our programs address community needs involving women’s and family health issues and provide economic opportunities. Chevron, Texas Children’s Hospital and Baylor College of Medicine support SAIL (Salud y Autosuficiencia Indígena en La Guajira), a pediatric program that is working with the community to decrease high morbidity and mortality rates for children and women in La Guajira. Chevron also partners with a cooperative of Wayúu women to provide weaving materials, training and marketing support. In 2013, Chevron received an award from Artesanías de Colombia, a government organization focused on protecting and developing Colombian culture, including the handcraft sector. From 2011 through 2014, approximately 1,860 women participated in the program.